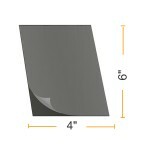 Video Card Size Heat Seal Lamination Pouches Laminating Pouch Measures: 4" x 6" (102mm x 152mm). Available thicknesses: 3 Mil, 5 Mil, 7 Mil and 10 Mil. Available finishes: Clear Gloss. Thermal Laminating Card size Pouches for use in a hot pouch laminator machine. 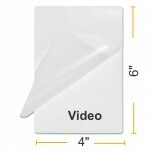 Add a slot to any pouch for just $10 per box of 100. Slotted pouches are not returnable. Please verify you have selected the correct side you want punched before placing your order.